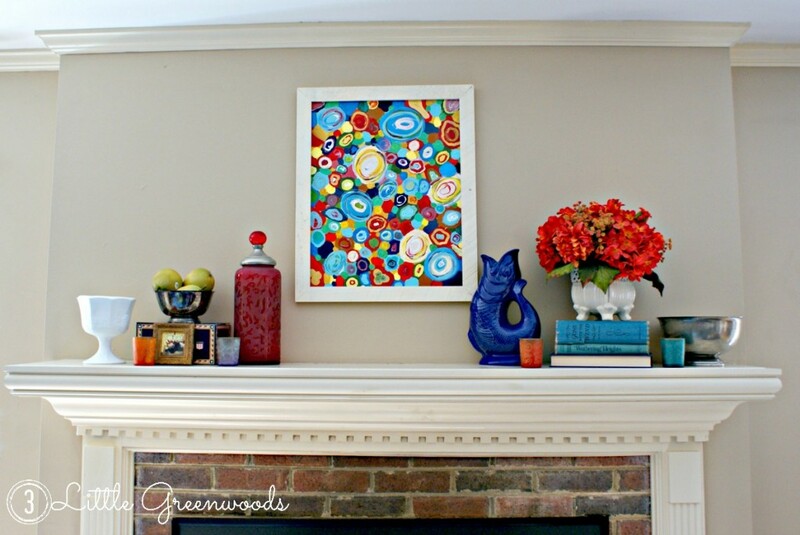 Creating unique pieces of artwork for your home is a fun and frugal way to add color and personality. 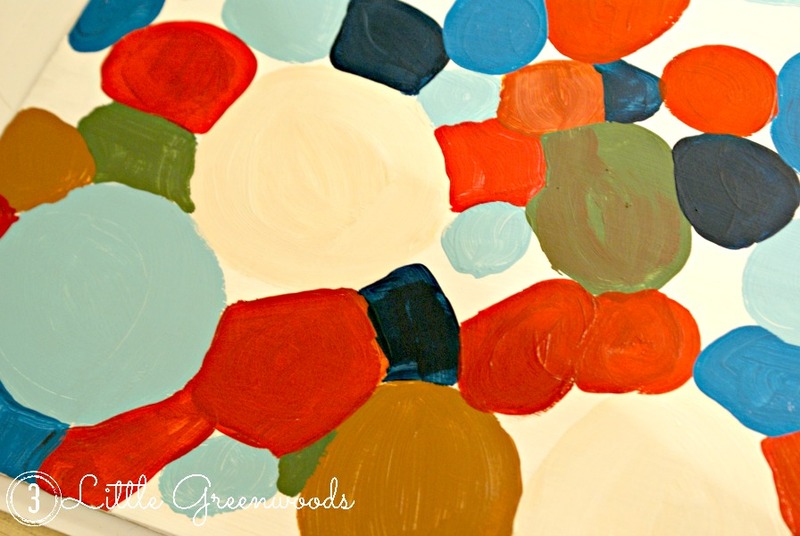 Today I would like to share with you a DIY Circle Abstract Painting I created way back when I first began blogging. You may have spied it on top of my newly transformed Kitchen Hutch. It’s peeking out from behind Mr. Rooster. 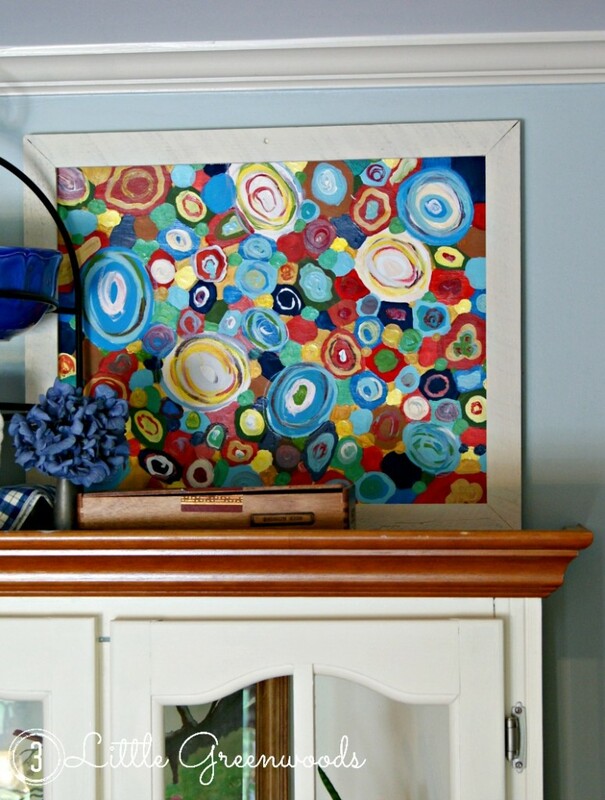 This hand painted artwork adds depth to the vignette and definitely a pop of color to the space. Every once in a while I get I got the itch to create to dip my paintbrush in some fun colors. When I do want to paint I head over to my Painting Inspiration Pinterest Board. There I found this pillow. Lots of circles. Lots of colors. Hey, I think I can do this. 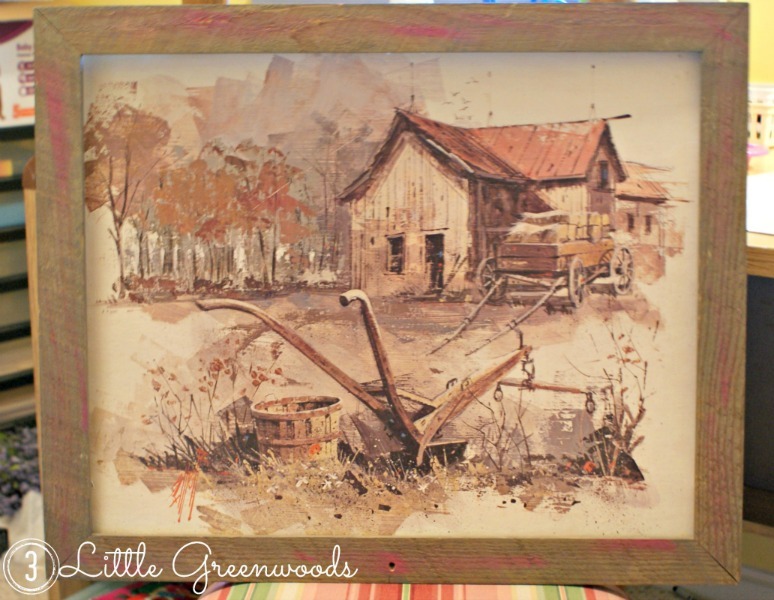 The project started with this awesome Little House on the Prairie inspired print. 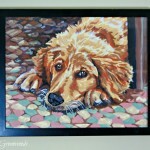 It had a sturdy frame and was the perfect candidate for blank canvas (after several coats of white paint of course). Many layers of white paint later… Little House be gone! 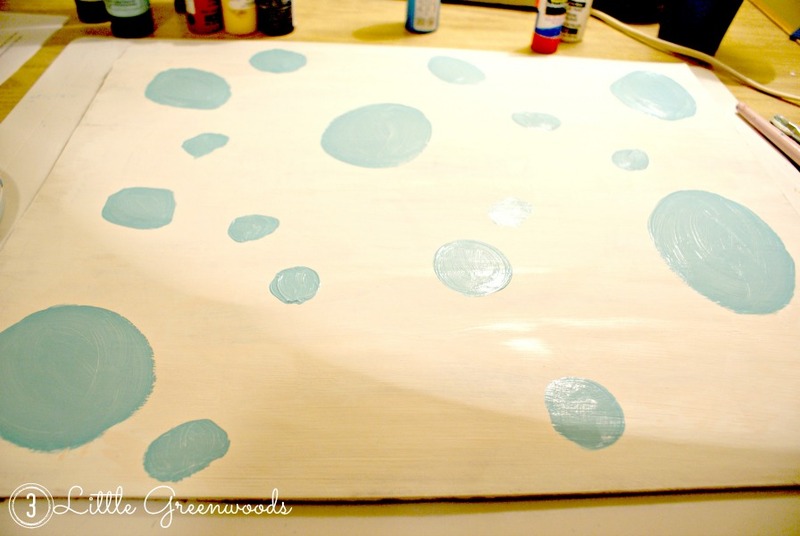 After selecting my paint colors, I began to paint different sized, different colored circles all over. Making sure to space out big ones, medium sized ones, and small ones as I went. If I had to do this over again I would base coat the background a color (maybe tan or even red) so the white doesn’t show through so much. 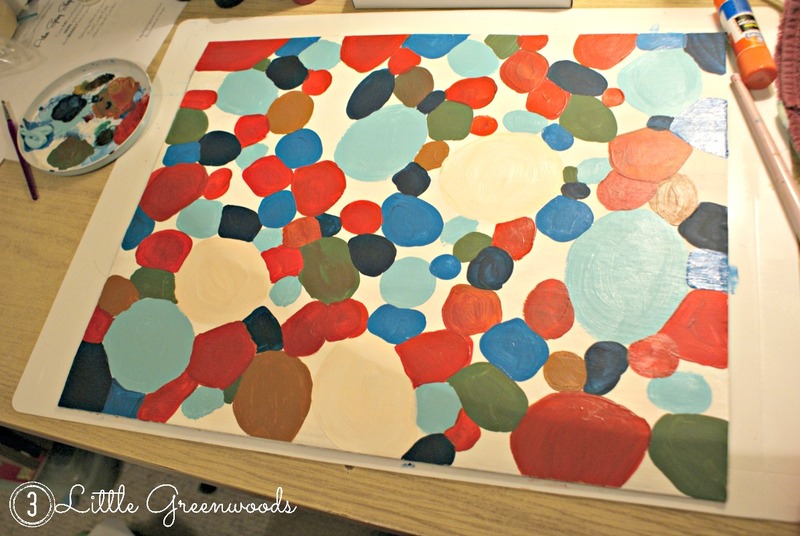 You want to fill in the entire piece with circles of different colors. 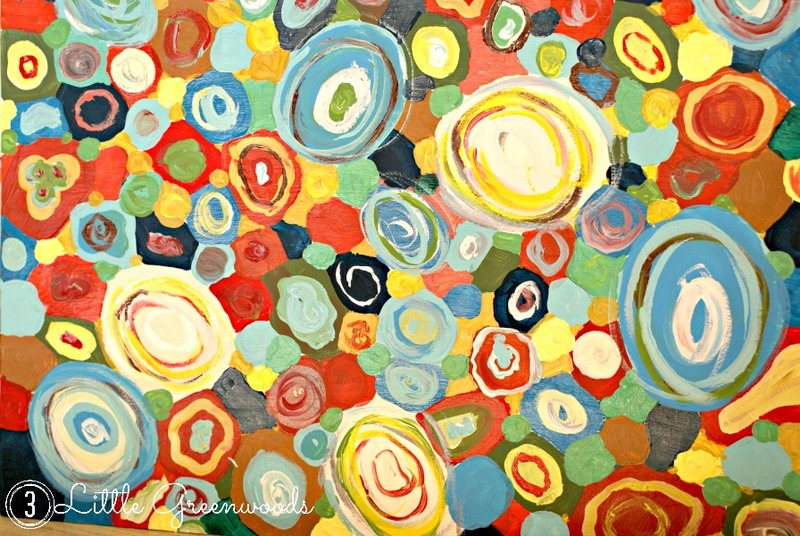 When the canvas was completely covered with circles begin to layer the colors by painting more circles on top of the others. Next add swirls of other colors to add more details. The more you layer colors – the more intricate it becomes. 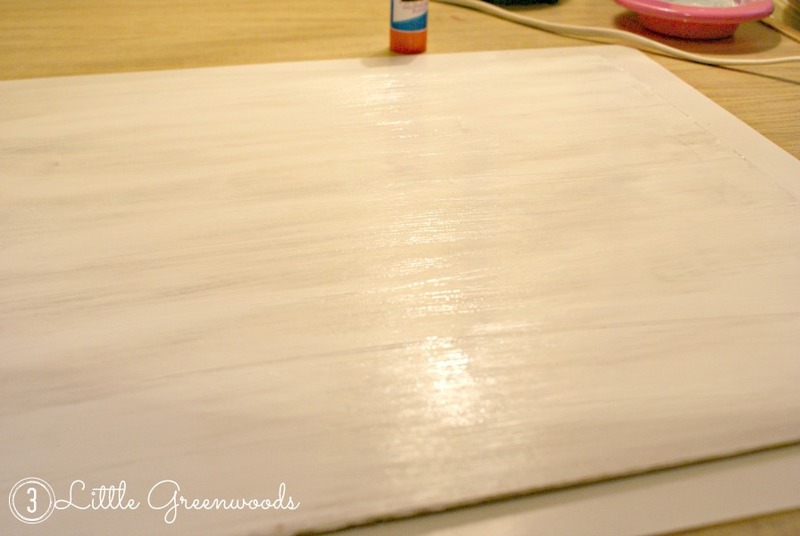 Once the frame was painted cream the DIY Abstract Art was ready to hang! It’s another one of those pieces that makes me happy when I look at it. Notice the original wall color? The living room is now a lovely soft blue. Much better than the tan/brown that covered every wall in the house. 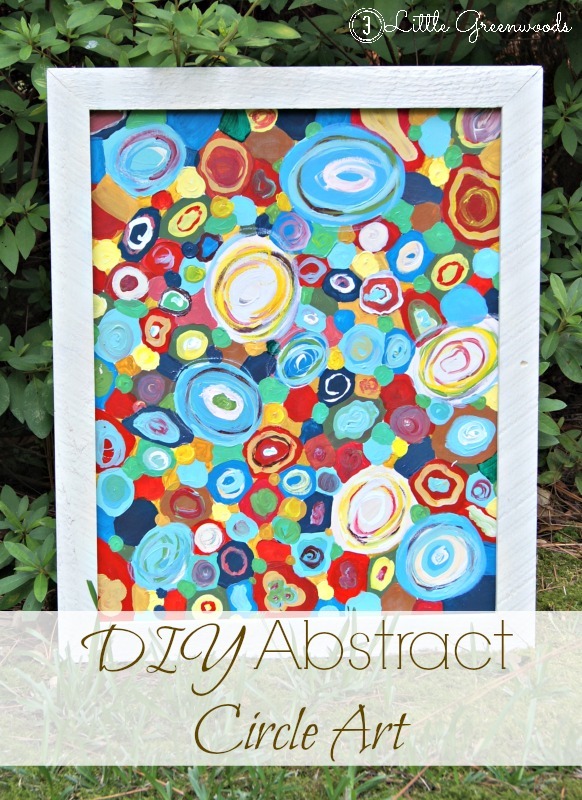 Hoping you are inspired to try DIY Abstract Art for your home! Co-Hosting Turn It Up Tuesday! DIY Container Gardening: Welcome to the Jungle! This is so cute Ashley! 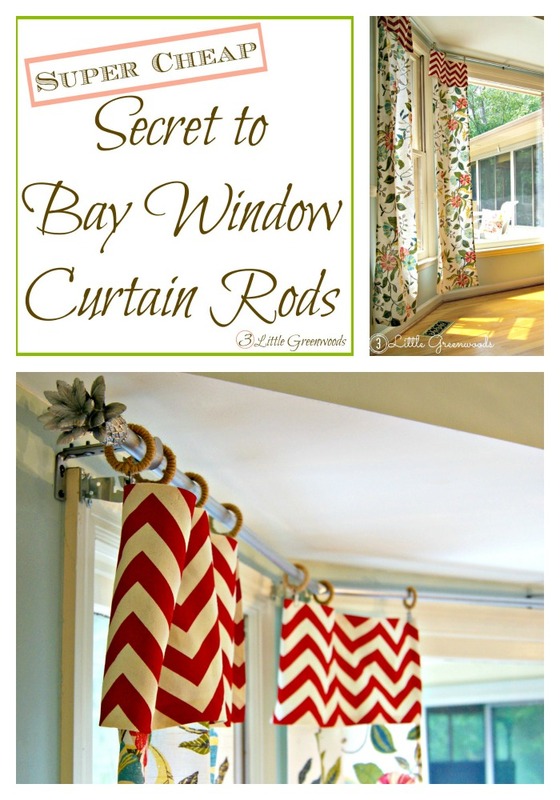 I love how easy it is and I can use this method for every room in the house! This is getting pinned! I bet my kids would love to do this. Did you already own it? It was a print that one of my grandmother’s gave me but you can find framed prints like that at Thrift Stores all the time. Thanks for the comment blog! I love it! Brilliant. I love finding inspiration in different things. Hey Leslie! Thanks so much for the sweet comment! 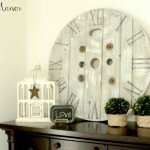 That turned out great and it looks perfect on your mantle! 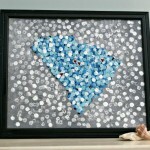 So excited that you like my circle art! 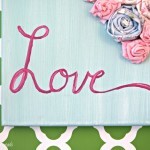 Thanks for the bloggy love! 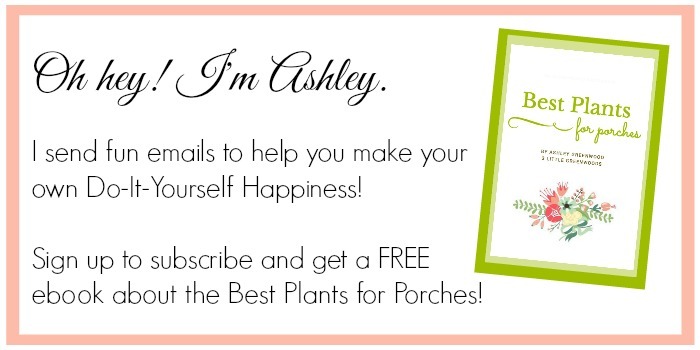 You did a great job, Ashley! 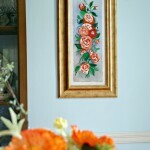 All the vibrant colors will allow you to display is just about anywhere! Love it! The colors bring so much happiness to the home decor. Pinned! Found you on Diana rambles. Thanks sweet lady! I’m itching to paint something else! This is so fun! Great tutorial, looks like it would be easy to recreate! 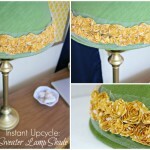 I love that you used fabric as inspiration for your color palette- that’s one of my favorite tricks. Thanks for sharing, I’m pinning! Colorful fabric is so fun, isn’t it? Thanks so much for the comment love! This is so impressive!!! It really looks like it should be hanging in a gallery somewhere! You are too sweet! 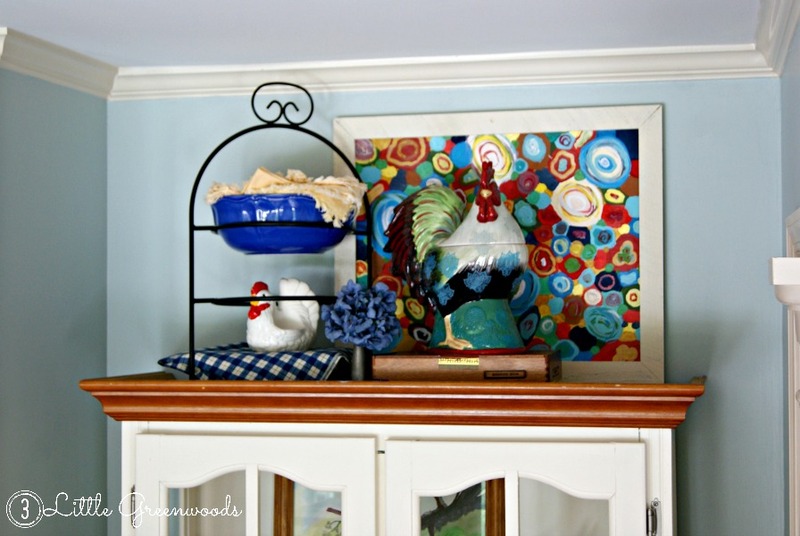 I do love the painting and was so happy it fit on top of my kitchen hutch! What a great inspirational post. You really showed how easy it it to make something beautiful and unique for next to nothing. 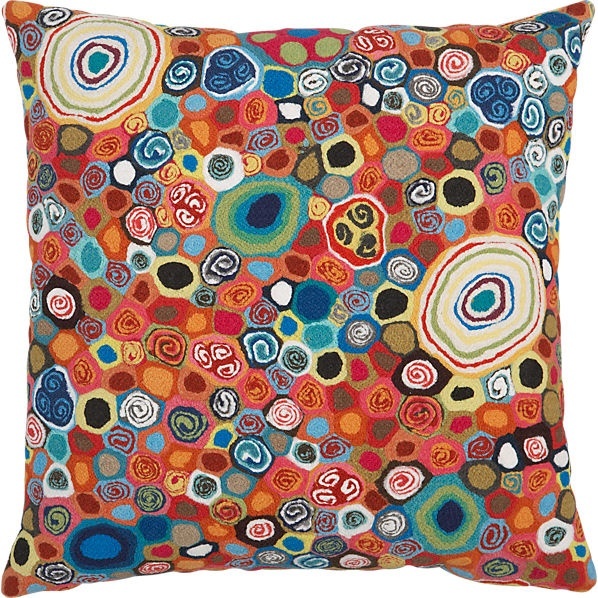 I have to ask, did you ever buy the cushion too? It is very lovely! This is so simple and adorable. I am loving all of the bright colors! Thank you for sharing at the Friday Favorites link party! Bright colors make me so happy! Thanks for the sweet comment! Thanks so much, Michelle! 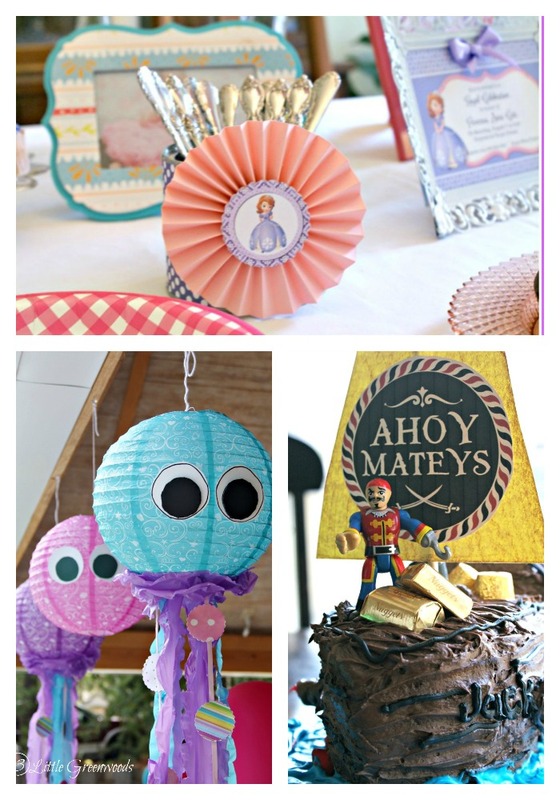 Love your fun party! Wahoo! Thanks so much, Mindie! Thank you for linking up last week at Friday Favorites, I chose you as one of my features! Hi Ashley, I am a first time visitor. I saw this post on the “Hit Me With Your Best Shot” linky party. This project is so lovely! The colors just really caught my eye. I may try and do similar for my office or the playroom. Welcome! Thank you so much for hopping over. 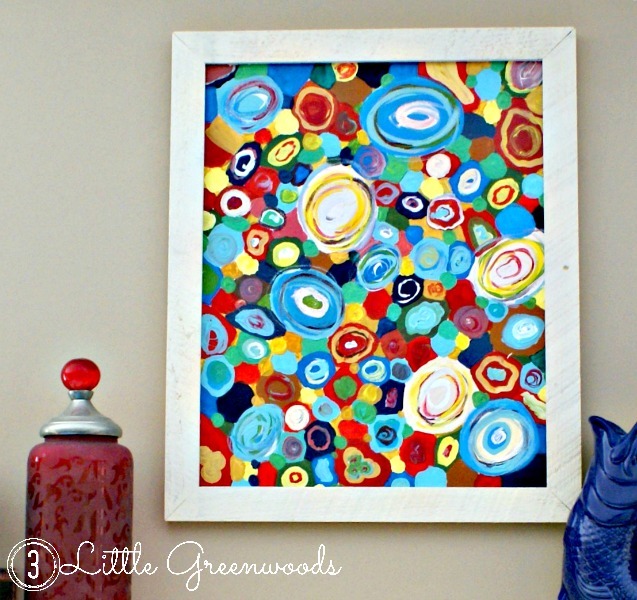 I love my abstract circle painting and am so excited that you do to! Fantastic job making this pic! I love it. I have thought of doing something abstract but I was afraid I would be only one who would think ti was abstract and not just a mish mash lol. Thanks so much for pinning this to the P3 Party Board! You are being featured tomorrow! YAY! Thanks so much Kim!